I have such a fun time knitting entrelac; I love the effect it gives, especially with yarns that have transitions in their color. 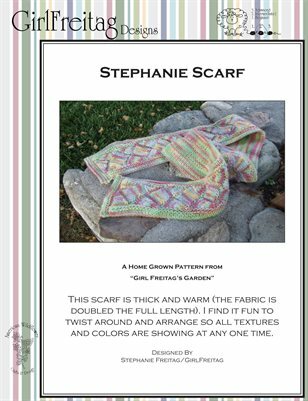 This Scarf is designed to pair with the Stephanie Hat & Stephanie Wrist Warmers though it will look equally nice with the articles in the Alexander set as well. When I heard someone comment that they wished the back was as pretty as the front of their entrelac pieces, I came up with two scarf designs that I hope fill that order. This is one of those. After creating these patterns, of course, I had to come up with some accessories to accompany each! This scarf is thick and warm (the fabric is doubled the full length). I find it fun to twist around and arrange so all textures and colors are showing at any one time.